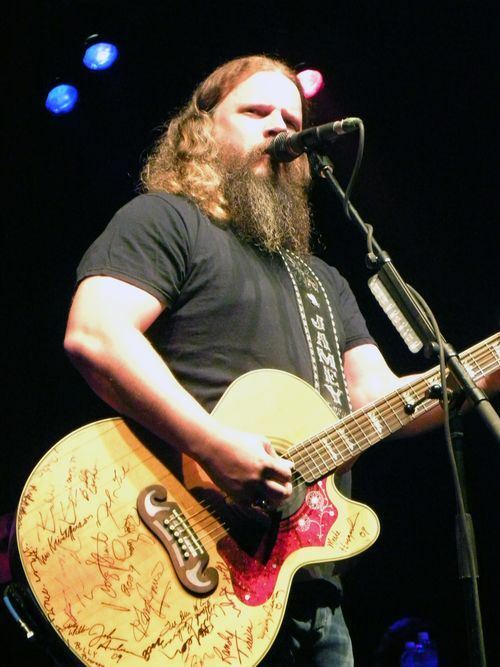 Jamey Johnson stood onstage at Crossroads in a black t-shirt and blue jeans. The wind that pushed temperatures to the mid-century mark on Saturday night frequently floated the long follicles of his hair and beard. Subtract the acoustic guitar and add some tattoos and Johnson could have easily been mistaken for one of the performers at Rockfest, occurring simultaneously just a few blocks away. Johnson basks in the music of his idols, both stylistically and aesthetically. Littered with signatures, his blonde acoustic guitar is clearly a tribute-in-progress to Willie Nelson’s famous six-string Trigger. Johnson’s 24-song was an immaculate honky tonk playlist, seamlessly crisscrossing between original material, Nelson, Merle Haggard, Waylon Jennings, Don Wilson, Hank Williams – both father and son – George Jones and Ray Price. The one-third-capacity crowd oscillated in their responses throughout the 100-minute set. They were either completely invested, whooping and hollering and singing along with every word as on “Get Straight,” “In Color” and several of the better-known covers, or completely disinterested and conversing over the performance. Perhaps the consistently low-key, understated arrangements wore thin, but given their overwhelming responses at times it’s hard to believe this crowd didn’t know exactly what they were getting beforehand. High points included a steamrolling “That Lonesome Song” that gained energy from the interplay between the pedal steel and electric guitarists. During a spirited reading of “Tulsa Time,” Johnson gave each of his six band members time in the spotlight as they passed solos across the stage. “By the Seat of Your Pants” opened with an a cappella verse capped with a rare Johnson solo on his acoustic guitar. After slowing the set to a crawl with the romantic “Amanda” and remorseful “Walkin’,” the night ended with the crowd-pleasing “In Color” and jubilant “I Saw the Light,” the most energetic number of the night. A few more moments like this would have kept the crowd in hand more consistently. When the houselights came up few could believe it was over. There was no encore and Johnson had barely acknowledged the crowd beyond working our town into his lyrics a couple of times. It was clear as he left, however, that Johnson was satisfied he’d made his mark. Setlist: High Cost of Living; Lonely at the Top; Cover Your Eyes; Night Life (Willie Nelson cover); Country State of Mind (Hank Williams Jr. cover); Can’t Cash My Checks; The Door Is Open (Waylon Jennings cover); Playin’ the Part; Mary Go Round; Tulsa Time (Don Williams cover); I Remember You; That’s the Way Love Goes (Merle Haggard cover); That Lonesome Song; For the Good Times (Kris Kristofferson/Ray Price cover); unknown slow blues cover; Still Doing Time (George Jones cover); Misery and Gin (Merle Haggard cover); By the Seat of Your Pants; Give it Away; Set ‘Em Up, Joe; Amanda (Don Williams cover); Walkin’ (Willie Nelson cover); In Color; I Saw the Light (Hank Williams cover).